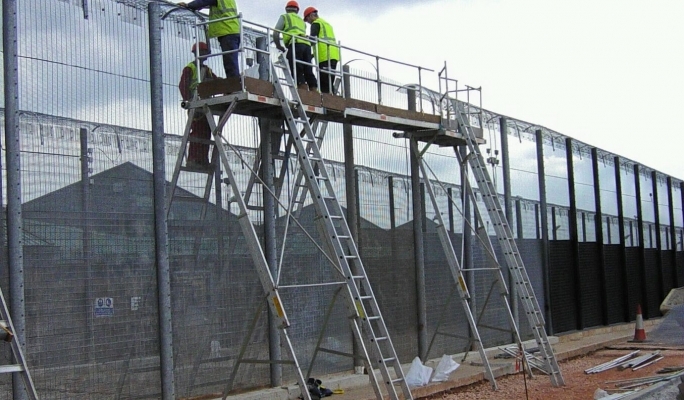 Easi-Dec is a scaffold alternative designed for the smaller jobs, giving access to the wall, second floor windows or soffits and gutters for maintenance and repair work. The platform is assembled in a matter of minutes, and can be lifted and shifted around a building with ease. The Easi-Dec is a 6.6ft long platform on adjustable telescopic legs, it’s built on the ground and then quickly raised to the required working height, giving the user a fully certified, safe, stable platform to work from. The Easi-Dec can be transported in either a in a cargo van or on a truck rack and can be installed and ready to start work in less than 10 minutes, a huge time saving advantage over traditional scaffolding. Fitting replacement windows, by including a self locking pulley system capable of lifting up to 165lbs. It gives the installer a compliant, fully protected work platform, as well as an opening in the base of the Dec for lifting windows through. After the window passes through the hinged opening it closes to maintain the platform integrity. The Window-Dec has individually height adjustable legs, so it can adjust with uneven or sloping ground without any problems. The Window-Dec system can be transported in either a cargo van or truck rack and can be installed with no tools required in less than 10 minutes. After assembly and erection of the platform, the replacement window is attached to the lifting frame with the 2 straps provided and hoisted up to platform level by pulling on the rope. The Solar Platform has been designed for smaller, thermal solar jobs, to gain safe access up to roof level and gives a cost effective alternative to renting scaffolding for each job. The Solar Platform offers the installer an OSHA compliant, fully guarded work station that sets up in a matter of minutes. The Solar Platform is 6.6' long on adjustable telescopic legs. It is built on the ground, then easily lifted into position, ensuring complete safety at all times. The system includes a cushioned rolling window bar, strap-operated legs and a hoist specifically designed for lifting solar panels to the roof. It can be transported in either a cargo van or on a truck rack. The Solar Platform can be installed and ready to start work in less than 10 minutes, a huge time saving advantage over traditional scaffolding.